The weather is definitely turning colder. After a warm 70 degree day yesterday the polar vortex is making itself known, and for me it signals that its time to stay inside more and primp my nest. You may remember back in September I did a bit of a wall update in my bedroom. You can read that here. 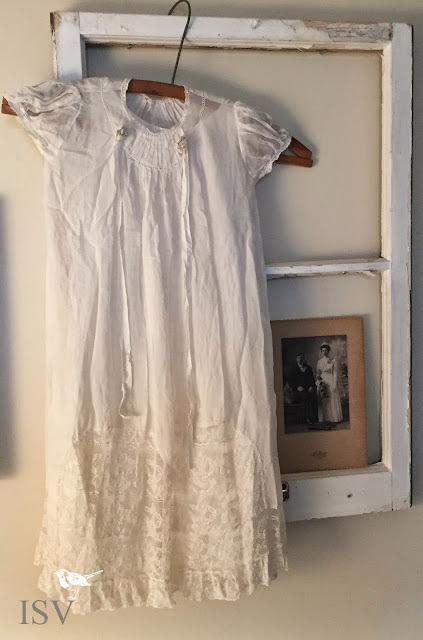 I found this beautiful vintage christening gown at an auction and hung it on my old window frame. I loved the combination, and still do. 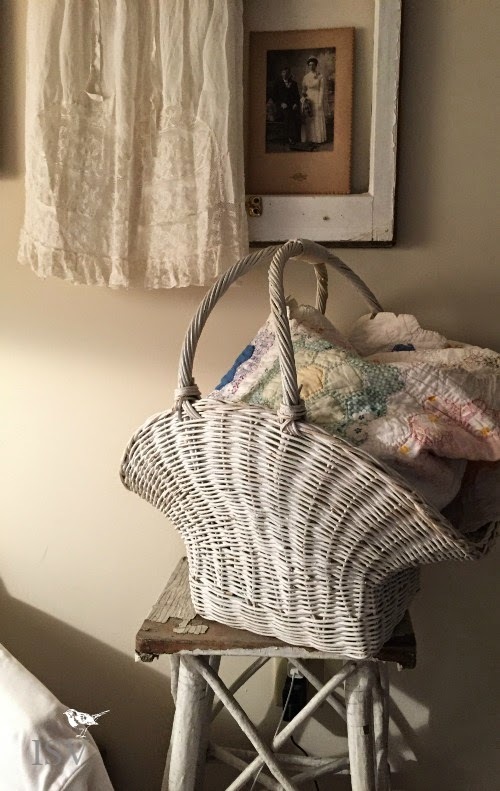 But, (there is always a "but" when it comes to decorating) I felt the space was still a bit bare. This corner is where I spend most of my time when I am at home. I sit here to blog, read, and watch TV. I love my comfy chair, that was in my bedroom when I was a teenager, but the space next to the chair was begging for an addition. 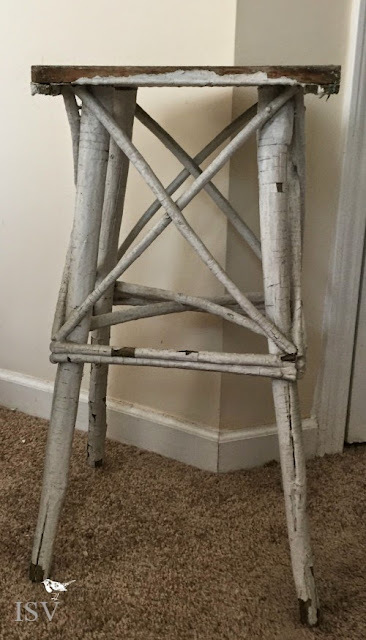 Then a few weeks ago I found this chippy old twig plant stand at a garage sale for three dollars. I love when I make scores like that. The top is really chipping so I will need to coat it to keep it from getting worse . 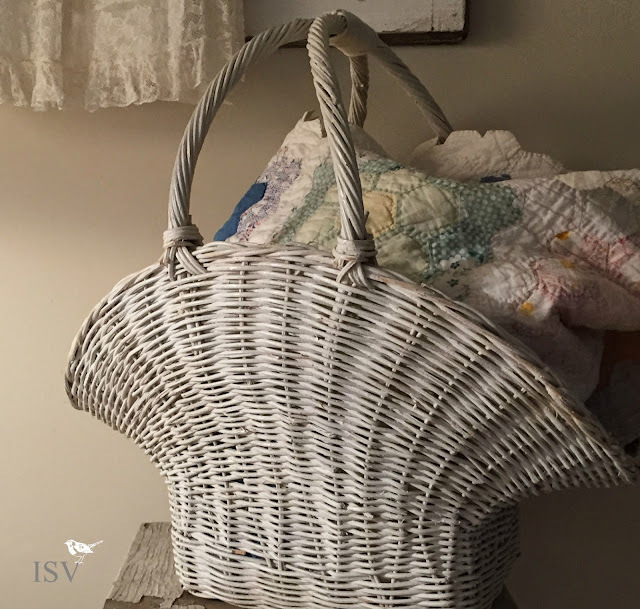 I moved this white basket from the hall, folded my summer quilt inside of it, and set it on the table. as I sit here looking around the room, I am realizing all of the other things that need to be done. Well as Scarlett said. "tomorrow is another day". If I just had Rhett Butler to help me move some of this furniture. Of course, I'm thinking maybe if Rhett was in the room you wouldn't want to spend your time moving furniture. Oh so vintage pretty, my friend! Looking cozy at your place. 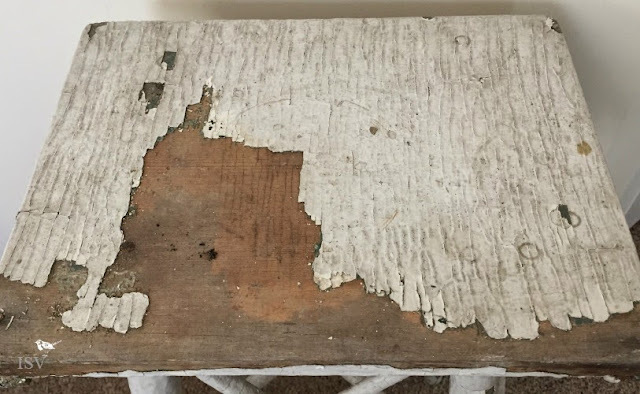 I love that little chippy table you found! The christening gown is a great find too. It's nice to have an area that you like to use and feel comfortable in. I have a favorite chair and ottoman that I sit in every night to watch tv and use the laptop computer. My dog tries to squeeze in on my lap too, so it gets crowded fast! LOL! Rhett has always been my dream man. Love him! He was definitely pretty dreamy. Oh a cheeky post ending, LOL! He is very dashing, so yes good choice. Lovely little vintage gown there, but then again Rhetts in the room, so who's looking at that right ? Great table and I love it with the basket.